Ran with Scott while FWA was in his clarinet lesson. Warm. Sunny. Windy. Crowded. Instead of our regular room through Boom Island, we decided to take the service road to the U and run across the pink bridge. That loop is only 2.2 miles so we added one more trip across Stone Arch bridge. This week in my poetry class we talked about the caesura (a stop of pause in the metrical line). Here’s a great poem, by a wonderful person, about the caesura. Love it! Is she in a kind of white now? Is it composed of no & no? is like the space of an envelope? Where the postage must go? white muzzle across the face? aren’t they all named Maria? with the smell of ammonia? Is it blurred & blank with flight? & no one seems to be grieving? Spring! Shorts, sun, Shadow, sparkling water, slight soft breeze. A wonderful run, even though it felt hard at times. Saw the Daily Walker but couldn’t greet him because we were running the same way. Encountered 2 separate groups of kids on bikes–one on the east side, one on the west. Heard some birds. Saw lots of brown. Noticed the white beach in the gorge, midway between the lake street bridge and the greenway. Watched my shadow for awhile. Mostly she was friendly but she irritated me on the franklin bridge right before I turned and she fell behind. Did a lot of counting: 1 2 3 45 1 2 345 then 1 2 3 4 5 6 7 8…thought about how 7 is the only number with 2 syllables. Why is that? Convinced my self to not stop to walk until at least mile 4 and managed to do it. I think I saw the man in black in shorts and not all black! Looked for the eagle on the dead tree under the marshall side of the bridge. Above all else, tried to stay focused on the river. Glad I could still see it–the leaves haven’t returned yet. At first it seemed still, not moving. But by the Franklin bridge I noticed its slow descent to the falls. I stopped on the lake street bridge to watch it more closely. Decided to talk into my smart phone. Maybe I can shape some of this into a poem? I’d like to try recording more of these moments this spring. A good way to force myself to slow down my runs. With practice, I’m hoping to get better at these brief recordings. It was hard to capture with words the strange beauty of the river’s slow movement in many different forms. Part of the surface was sparkling, shimmering, undulating. Some was smooth, flat. A few vees were visible–was something in the water disrupting it? And then, the ghostly swirls. Speaking of vees, right after I finished recording, a skein of geese flew overhead, not too far above the bridge. It’s raining outside. Glad it’s warm enough not to snow. 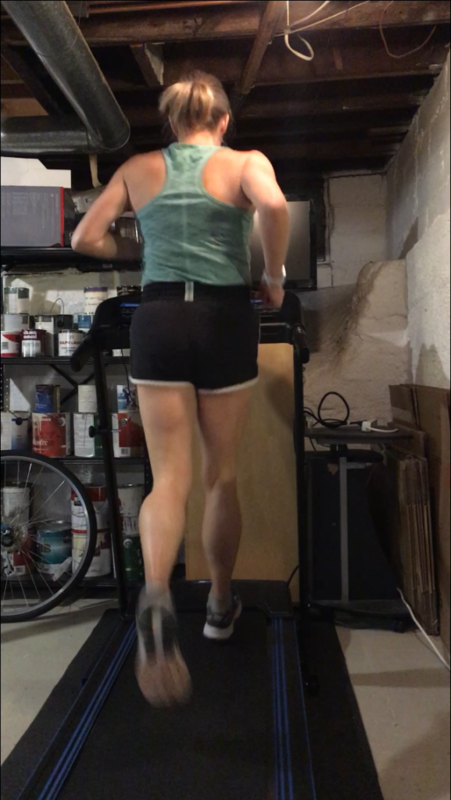 Decided to warm up on the bike and then record myself running to check out my form. Pretty good. I think my right hip is slightly lower. Just looked it up and this “hip drop” is caused by a weakness in the opposite leg, which makes sense because it is my left leg/hip/back giving me problems right now. Back when I started running, I never thought about my body. It worked fine, so why pay attention to it? Now, I have aches and pains and injuries. These are frustrating and painful and scary but I do appreciate the new, more informed, relationship I’m having with my knees and hips and back and the rest of my body. It’s difficult growing older and having to try harder to not hurt but, at the same time, I’m enjoying learning more and having the chance to pay attention to my body. So helpful and interesting! Also, when I was biking, I watched the first episode of Shrill and I’m excited to watch the rest of the season. Hooray for unruly, excessive bodies making trouble! What a day! Sunny. Light breeze. Warm. So long snow. Passed a woman early on, breathing heavily. Her loud gasps, almost echoing above the gorge, followed me for a few minutes. Celebrated with my shadow, both of us so happy to be outside this morning. Wondered what the workers in yellow vests were waiting for near the lake street bridge. Heard that same barking dog–the one I heard a couple of times a few months ago–pass by me in that same white truck. Weird. Stopped at the railroad trestle and took the steps down, below the trestle, still above the river. Hiked for a few minutes, climbing a few small hills–more like mounds. Heard a few woodpeckers. Turned around and had a wonderful view of the underbelly of the railroad bridge. Then started running again. When I was almost done, a squirrel decided to race me, not darting out in front of me but running beside me through the dead leaves. Was able to say good morning to the Daily Walker. Began with snowstorms, one after another. Rings when it was cut up for firewood. Set in. Cars skidded on the icy roads. Rifle shots as they broke off all night. From the world below to seek me out. The snow is melting. The birds are chirping. The path is almost all clear. So quiet and calm today. Mostly cloudy, making the river look gray. The floodplain forest was all white. Occasionally the sun sat on the surface of the river leaving a bright circle of shimmering light. Saw a few squirrels. Heard some geese. Any crows? I don’t think so. A few voices below–a family hiking through the snow on the gorge. I wonder when the rowers will return? it for me in your poem. won’t come back I write in darkness. I picked this last one because it made me think of Susan Howe and her story about Jonathan Edwards and how he would pin ideas he had on scraps of paper to his clothes as he was riding around on his horse. A couple of years ago, I was thinking a lot about how runners hold onto the ideas that they have as their running–scribble it on pieces of paper, carry a small notebook, scratch it in their arm with a stick, talk into their smart phone. Maybe I should experiment with this some more? As I was trying to recall who Howe had been talking about (I had forgotten), I discovered that she wrote a book about Emily Dickinson, My Emily Dickinson. I might have to check it out of the library. Apparently, Dickinson wrote many of her poems on scraps of paper. Snowing again today. Wet, sloppy paths. But soon the snow will melt and it will turn green. Too green. Time to take up my project of collecting poetry about green and thinking about the Mississippi River Gorge in the spring. & inhale our visible chilled breath. & inhale their clear exhalations. Love these ideas of trees and breathing and inside/outside! Winter storm warning outside. High winds, heavy snow, falling branches, covered path. School cancelled. So glad we have a treadmill. Although, if it weren’t so windy, I might have enjoyed running outside and hearing the satisfying squeaks and crunches of the heavy, water-logged snow. I’m not happy about this snow, but I also don’t really care. It will melt within a few days. camps back at caballada ranch. Hangs kack, ax, and camp hat. slam Law a damn mass war path. and Kansan gasps, blasts back. A flag flaps at half-mast. What a poem! I love writing under constraint, although limiting all vowels to A seems extra hard. (here’s a guide to the poem.) This technique of eliminating all vowels but A is a OuLiPo technique. Here are some others I found on Wikipedia–I’ll have to try them out. Replace every noun in a text with the seventh noun after it in a dictionary. For example, “Call me Ishmael. Some years ago…” becomes “Call me islander. Some yeggs ago…”. Results will vary depending upon the dictionary used. This technique can also be performed on other lexical classes, such as verbs. Writing that excludes one or more letters. The previous sentence is a lipogram in B, F, J, K, Q, V, Y, and Z (it does not contain any of those letters). Decided to run again this morning because tomorrow winter returns: ice, snow, blizzard conditions. Hopefully it will melt quickly but if not, at least I was able to run just above the gorge today. It’s sunny and windy. My legs felt sore–not injured sore, just sore sore–and it was hard to just be in the run, not thinking. I tried chanting a little and that helped. Strawberry blueberry raspberry. Haven’t seen the Daily Walker in a while. Enjoyed listening to the grit scratch scratch scratch. Noticed a few stray patches of snow down below the lake street bridge. Marveled at the beauty of the floodplain forest, bare and brown. Didn’t really look at the river. Encountered a few dogs and their owners. I think I was that one friend to my mom. We would sit in the two matching chairs in her bedroom, watching bad tv–mostly The Real Housewives of New York–and good tv–the barefoot contessa–and laugh and talk, forgetting about how she was dying from stage four pancreatic cancer. A beautiful morning. Sunny. Warm. Not too windy. Ran towards the falls instead of downtown. Tried to hang onto some thoughts about my vision diagnosis from 2016. What did I feel when the doctor told me I was losing my central vision? Relief, mostly. Finally I knew what was wrong with me. It wasn’t something I was making up and it wasn’t neurological (my big fear). Now that I knew I could deal with it. This relief lasted for a few months and then the doubt crept in as I wondered if my vision was really as bad as the doctor said it was or if my easy acceptance of the diagnosis was too easy. Then, I discovered that what I had been diagnosed with (Best’s disease) was not actually what I had. Instead, I had a rarer, more vague form of cone dystrophy–pinpointing the exact disease might not be possible, wouldn’t change anything and would involve annoying, costly test. I had a great thought about this just as I was starting my run, but then forgot it. I should have stopped to speak it into my phone. Something about knowing and not knowing, embracing the uncertainty of never really knowing and accepting that knowing exactly what my vision problem is won’t make a difference in my treatment (there is none) or the speed at which my central vision deteriorates. And, in fact, knowing is not possible. This not knowing is not ignorance–more like never knowing enough, having perpetually incomplete knowledge, the impossibility of KNOWING. Wanted to run outside this morning but it kept raining. Of course, now that I’m done, it has stopped. Still gloomy and wet. But my back doesn’t hurt and I feel good and I found a new show that I love watching–Father Brown–and I’m in the midst of an exciting writing project and open water swimming is only 2 months away, so I’m fine. I love my poetry class. Amazingly, I feel totally fine about not being very good at analyzing poems or giving other people feedback about their poems. There is so much I don’t know or I can’t quite get (yet) about line breaks and rhythm and ending lines on strong words or soft words. The trick for me is to study these techniques without having them take over my writing. Today I tried to listen. Some sounds I heard: the scratching of a metal rake on the bare pavement; a buzzing plane up above; birds chirping and cooing–any cawing? I can’t remember; the crunch crunch crunch of my striking feet on the gritty path; another plane roaring; dead leaves shuffling in the wind; car wheels whooshing. Then I forgot to listen and marveled at the earthy brown gorge. Why do I find this color so appealing? Looked through the floodplain forest all the way to the sliver of river. Greeted the Welcoming Oaks. Noticed a number of branches gone–must have been what the Minneapolis parks crew was doing in January with their chainsaws. Said good morning to the Daily Walker towards the end of my run. Chanted triplets. Wanted to stop and take a break at the 2 mile mark but didn’t. Decided that 40 degrees and slightly overcast are some of my favorite conditions for running. It’s my puzzle to work out, and yours, and Szybist’s too, and where those bubbles overlap, where one interior meets another, and where inner meets outer, is poetry (29). Again, the inner and outer. Where inner meets outer. Inside outside. Inner weather outer weather. Lately I’ve been briefly waking up at 5:30 and then going back to sleep until 6:15 when the alarm goes off. This up too early then back to sleep again produces some vivid dreams. This morning, I dreamed about my mom, before she was sick. She was healthy and happy and wearing just the right shade of bright orange pants and red lipstick. We looked at each other and smiled. I woke up happy, thinking about how wonderful it was to see her again, especially in bright orange pants. her fingers through hospital sheets. I love this little poem that I discovered the other day. Finally, after more than 2 months I was able to run the franklin loop! I checked and the last time I ran it was on January 7th. A wonderful morning for a run. It felt much warmer than 39 degrees. Sunny. I watched my shadow in front of me. Checked out the floodplain forest below me. Listened to the satisfying sounds of gritty sand crunching under my feet and the cars slowly approaching on the road from behind. Noticed several squirrels, too busy to dart out in front of me. Recited a few triplet melodies (raspberry/strawberry/chocolate) and a line or two from “Sick” by Shel Silverstein (I cannot go to school today/said little Peggy Ann McKay). Crossed the Franklin bridge and ran on a sidewalk stained white from salt. Glanced down at the East River Flats and a giant rock, almost taller than me, lodged in the grass between the walking and biking path. Made note of the terrible condition of the road between the Franklin bridge and the railroad trestle. So many potholes! Wondered if the eagle that used to perch on a branch near the marshall/lake street bridge was back (they weren’t). Decided to walk up the steps instead of running up the hill and crossing the road at the spot where a runner was hit by a car and killed two years ago. Since it’s Robert Frost’s 145th birthday, I thought I’d post my favorite Frost poem. I read it in high school and I think it was one of the first poems I ever memorized. It helped me through my injury two summers ago. Colder, causing an occasional slippery spot. Still felt like spring. Again, bright sun. Bare, brown ground. Open paths. Was able to mostly run on the walking path for the first time in months. I enjoyed the run but was always worried about my back. It didn’t hurt while I was running, but it’s been sore off and on for a few months. I don’t remember hearing the grit on the path or any rustling leaves. Too cold for dripping water. I think the most memorable thing about my run was the river. Dozens of ice floes slowly moving down the river. Beautiful and calming. At the halfway point, I stopped to watch their graceful progression towards Minnehaha Falls. As I ran back I wondered about our relative speeds–mine and the ice. Layers: too many! 2 shirts, a vest, gloves, a buff, running tights, visor. The gloves came off after mile 1. My orange shirt, after mile 2. Pretty soon, I’ll be wearing shorts. We are more than midway through the Great Melt of ’19 and everything is starting to feel springy. Sunshine. Warm air. Brown ground. Even though it’s only 41 degrees it still felt warm enough to be in short sleeves for the second half of my run. It’s been a long time since my arms have had direct contact with the sun. Slowly, I’m losing layers. The river was completely open. The path, clear. I went to the right instead of the left today so I didn’t see the Daily Walker or the Man in Black. Encountered a few dogs and their humans. Some bikers. A runner in shorts and a tank top. At least, I think he was wearing a tank top–it was the color of his flesh, so it was hard to tell. I don’t remember hearing much as I ran–a few voices, approaching me from behind. I wondered if they were running or biking (they were biking). And some kids having fun at the playground. I don’t remember dripping or airplanes overhead or the hum of traffic on the other side of the river or grit crunching under my feet or my heavy breathing or crows cawing. Forgot to think about anything else but how beautiful it was and how my back was a little sore. Someday soon, I should record myself talking as I run or give myself something to try and think about. addendum: I almost forgot about the black glove I saw lying on the edge of the path looking forgotten. Why is it always black? How long has it been there–was it buried under the snow or lost today? Is it missed? Was it dropped right on the spot where I saw it or had it traveled from somewhere else, carried by the snow? Did a runner lose it? A walker? At night? In the morning? During a snowstorm? So many questions! I’ve started checking out Poetry Daily every day. 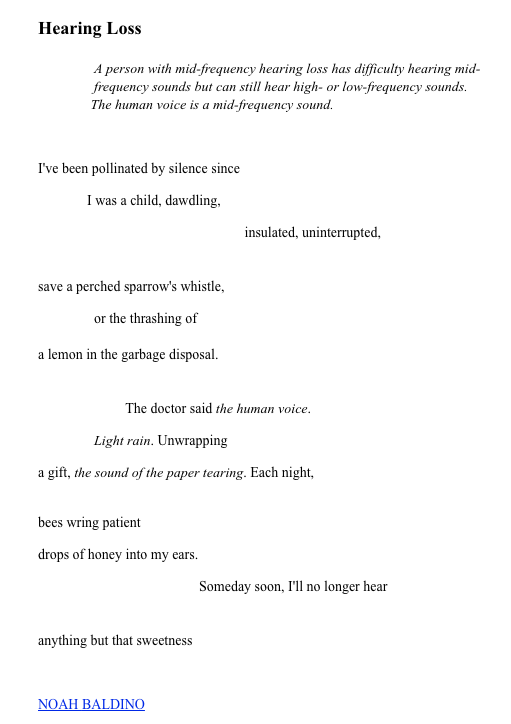 Last week, I discovered the poem, Hearing Loss by Noah Balding. They cannot hear the human voice, but only other, peripheral sounds. This reminds me of my vision problems and my inability to see faces. The first day of spring! The snow continues to melt, the path continues to get clearer. Listened to my playlist so I didn’t hear any birds or melting snow or gabbing geese. Ran faster. Smiled more. Felt overheated–too many layers. Sometimes the sun was out, sometimes it wasn’t. Never enough for me to see my shadow. Everything is still brown. No green yet. Definitely no flowers. Hopefully no more snow. 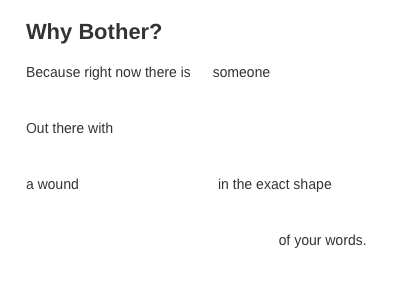 Before going out for my run, worked on a poem I’m doing about vision and my inability to see when/if people are trying to make contact with me. Mostly I can see people’s eyes–at least that they have them and the whites and the pupils. But I can’t see when the pupils move, when they shift, expand, contract. So I can’t always tell when people are looking at me. It makes reading people difficult. Officially, spring starts this week. And, unlike many past Minnesota Marches, it feels like spring is starting too. Still barely reaching the 40s. Still snow on the ground. But birds and bright sun, more melting snow and a vague sense of warmth/warmish air is all around. A good run but one tinged with some worry. Scott has arthritis and unless he’s able to change the way he runs, he might have to stop running altogether. Most likely he won’t be able to run the marathon. I am sad for him and for the possibility of not running with him. And worried, wondering if the marathon might be too much for my body too. Before my run, I felt every ache–in my lower back, my right calf and knee, my left foot–more acutely. the wick and it disappears. I tried to think about the body and the soul while I ran, but I mostly thought about my body only: my knees, back, shoulders, toes, feet. Were they sore? Was I landing on my foot correctly? How’s my right knee? Are my shoulders too tense? The other day, I wrote about running in the fog. Here’s a poem someone posted on twitter this morning. It’s from The New Yorker, May 2012. Birds! Sun! Almost clear path! 50 degree weather next week! Finally. This last month of winter has been rough. Too much snow. Too much cold. Too much ice. It’s still cold. And there’s still snow and ice. But spring is coming someday soon. My run today felt good. Hardly any wind. Long stretches of clear path. Heard some trickling water and lots of disembodied voices. Behind me on the path. Below me in the gorge. The river was completely open, sparkling in the sunlight. Do I remember anything from the run? Taking my gloves off around mile 2. Pushing up my sleeves too. Feeling my ponytail flapping as I picked up the pace. Running/gliding/sliding over a short stretch of sheer ice between the lake street bridge and the greenway. Passing lots of pedestrians. My poem for today is WS Merwin’s Sight. He died yesterday. A wonderful poet. I love the form of this poem. 5 quatrains. Each one starting with a one syllable word. Back to the treadmill today. After the Great Melt of 2019–9 inches of snow gone in just 2 days!–it got cold again. Too icy on the sidewalks for me. Maybe someday the treadmill will inspire great thoughts or provide awesome runner’s highs, but not today. That’s okay. I’m just happy to be moving. together to keep each other company? to look for its partner. reuniting it with its twin. I’d like to do more with this idea of abandoned gloves and other items of clothing on the trail. What might they be doing when we’re not looking? fly through this valley ever. kids grow like gourds from women’s bellies. Like I said, no Indian I’ve ever heard of has ever been or seen an angel. Pastor John’s son is the angel—everyone knows angels are white. some white god came floating across the ocean? ’xactly where they are—in their own distant heavens. Zion or Oklahoma, or some other hell they’ve mapped out for us. I do also remember encountering 2 dogs with their human, walking in the rain. in the relaxed early-evening avenue. entices him to arcane happenings. smiles and grumbles to himself. Love the last sentence: “The three of them are enveloped–turning now to go crosstown–in their sense of each other, of pleasure, of weather, of corners, or leisurely tensions between them and private silence.” Enveloped. Such a better word than surrounded or consumed or covered or layered. In what was I enveloped today above the gorge?